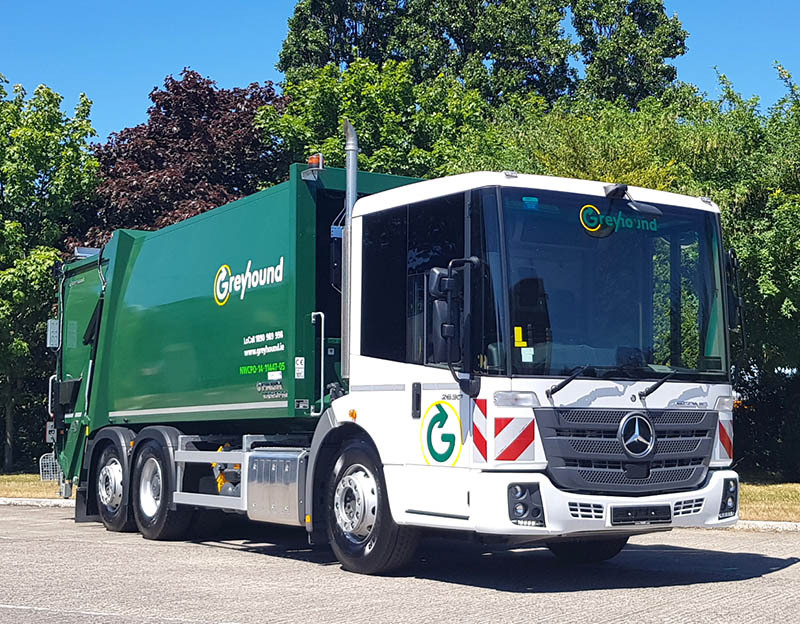 Mercedes-Benz has continued to build on its presence in the commercial waste collection market with the sale of yet another Econic 2630L model, this time to Greyhound Waste, a leading commercial waste operator in Ireland. Supplied to Greyhound by Walker Vehicle Rentals, the new Econic 2630L is the latest in the current generation of Mercedes-Benz waste collection vehicles. Amongst a host of special features that make it ideal for-street-to-street operation are Lane Keeping Assist, Attention Assist and Active Brake Assist. Its various other features include full air suspension and a low entry cab that make it ergonomically comfortable for working long shifts on the road. Bodywork is fitted by Faun Municipal Vehicles in Germany and finished in the Greyhound’s instantly-recognizable, high-profile livery.